Note: For those that attended Jaap and my workshop on Monday, Advanced PowerShell Management of Office 365, the EXO slidedeck is available here, and the sample code is available here. Session slidedecks or handouts available through the app or Connections site. Last Monday, I returned from the largest, independent conference on Microsoft technologies, IT/Dev Connections. Well, that should have been Sunday, but technical issues with the airplane and lack of options to fly back to The Netherlands the same day resulted in an extended stay, but that’s something for another story. IT/Dev Connections is a 3-day conference, consisting of 6 tracks holding a total of ~280 sessions. Like previous editions, the event again took place in the nice resort that is Aria, Las Vegas. Almost traditionally, the is a pre-conference day where workshops are given. One of these workshops was Advanced PowerShell Management of Office 365, done by Jaap Wesselius and yours truly. The turn-up was good, even considering we had some though competition this year from workshops such as PowerShell Masterclass and Office 365 IT/Dev Connections Power Camp. Again it was my only session, so I had the rest of the week ‘off’ to attend sessions by fellow presenters. Left to right: Tony Redmond, Paul Cunningham, Gareth Grudger, Jeff Guillet, Michael van Horenbeeck, Konrad Sagala, Andrew Higginbotham, Gary Steele, Ingo Gegenwarth, Paul Robichaux, J. Peter Bruzzese, Jaap Wesselius, Michel de Rooij and Sigi Jagott. Picking sessions for wasn’t an easy task this year. For Office 365 / Exchange (On-Premises) and PowerShell minded professionals, there were a multitude of sessions to choose from, and many times you discovered they were given the same time slot. The app was a big help picking sessions, and to be honest the app was a big improvement over last year’s app – kudos to Penton there. It could also be used to retrieve handouts, which made it easier to follow the contents presented by clicking through it on your own screen. Wednesday saw an interesting ‘Bamboozle the Exchange Experts’. People from the Exchange Product Group were flown in for Connections to answer audience questions. During this session, none other than Greg Taylor, Ross Smith IV, Brian Day, David Espinoza, and Jeff Mealiffe took part in the panel, and Tony Redmond took it upon him to be the MC. It was not only insightful and interactive, it was fun, and the PG seemed to enjoy it as well. If you are considering attending this event next year – and you should – know that with an attendance of ~1200 people (guesstimate), and apart from the fact that it’s independent and sessions are done by experienced people from the field, it also excels in that it is big enough to matter, yet small enough to hold an intimate feel to it. Compared to Ignite, one could say that there is less walking involved – or congestion, no full room issues, way better food and thus an overall better experience. 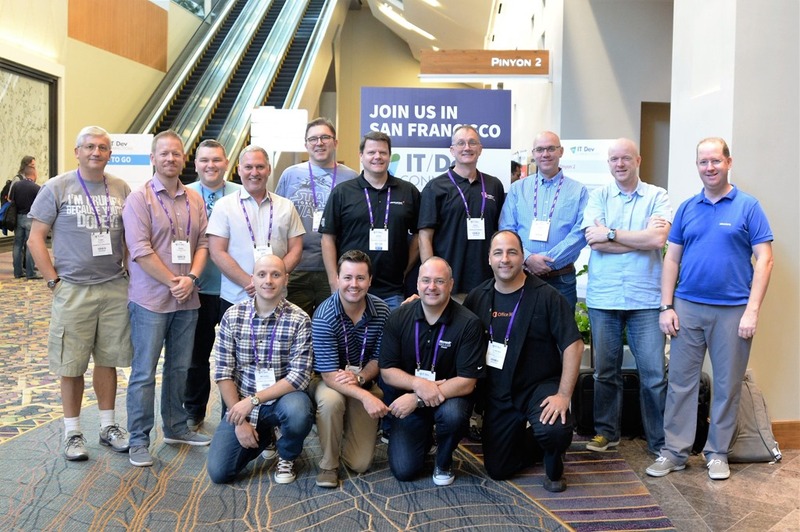 Now if you plan on attending (or trying to get a speaking engagement – yes you, Maarten) for IT/Dev Connections 2017, and as the group shot above gives away, be aware Penton has decided to move the event for next year to San Francisco. So save the date: October 23-26, the Hilton, San Francisco (Union Square)! Special thanks to Penton for having me, ENOW for hosting yet another great Scheduled Maintenance party at the Ghostbar, Quadrotech for finally being able to catch up, CodeTwo for having me for an interview.